Anyone close to me knows I have been a Marvel nerd ever since I saw the first Iron Man movie. I have seen every Marvel Studios movie since then (most of them several times in the theater before buying the blu rays…yeah..I’m legit) and one of my favorite things about Marvel movies is their intro with the Marvel logo. Its a short animation of comic pages moving flip book style and then slowly the Marvel logo fades into view. However, despite the amount of times I have watched this intro, apparently there was something I have missed all this time. If you look closely (and I mean VERY closely) as the pages flip you will see a very prominent image of what appears to be a Nissan 350Z. The Z also appears to be saving a guy from what is probably a pretty hairy situation! So, what does it all mean? Nothing really, I just thought it was cool that despite my dive into fanboy-dom I was still able to find another connection between my passion for cars and my growing fondness for comic book heros! Although if there is any meaning here it would probably be in the mysterious nature of this particular comic panel and its placement. What specific comic is this from? Who is driving the car in the panel? 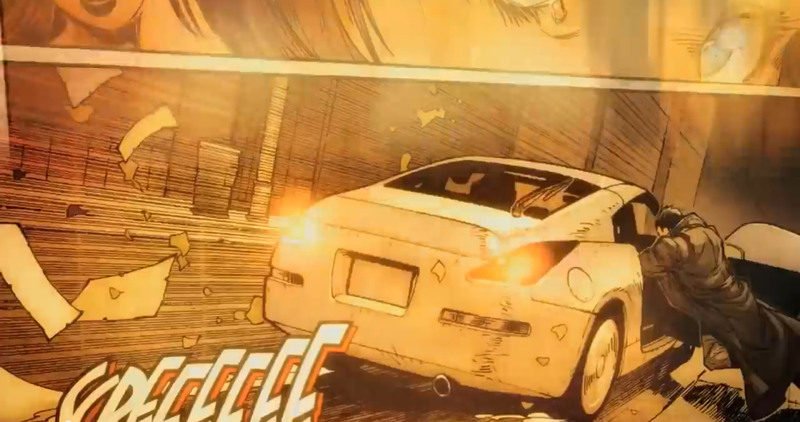 Was this panel purposely placed into the Marvel Studios intro secretly by some Marvel employee who happens to be a gear head or is it really all just a random coincidence? It might also be of note that the Marvel Studios logo animation was changed to show a 3D logo rather than a 2D logo and this image can only be seen in the newer intro which I believe they began using when “Thor: The Dark World” was released. If anyone out there in the interwebs can shed some light on this and trace the origin of this comic panel, we may just have a little reward for you! Let us know in the comments if you have answers! You can see a larger version of the image by clicking the thumbnail below as well as a video of the Marvel Studios intro. If you pause the video at exactly 2 seconds in, you’ll see the image in question.